Sleep - Volume One. Vinyl LP. Bleep. Since stoner metal originators Sleep returned to the fold in 2018 with their excellent LP The Sciences, now seems like a good time to (re-)acquaint yourself with the band’s back catalogue. 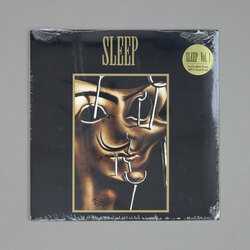 Sleep’s first full-length Volume One dropped in 1991. The group were yet to fully embrace the wall of fuzz that would characterise later records like Dopesmoker, and the powerful drumming, zippy guitar lines and loud-quiet-loud song structures have something of Nirvana about them. That said, the passages of intense distortion and larynx-shredding vocals that crop up all over Volume One usher the record away from the pop sensibilities of Cobain & co.